This post here by Christian prodded me to write about another interesting feature in the BI EE and Essbase Connectivity. 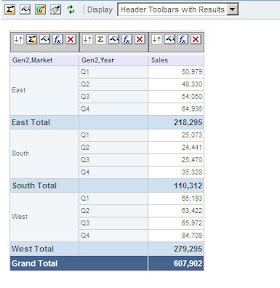 As you would probably know BI EE supports report based grand totals/sub-totals in a table view. There are 2 types of totals. 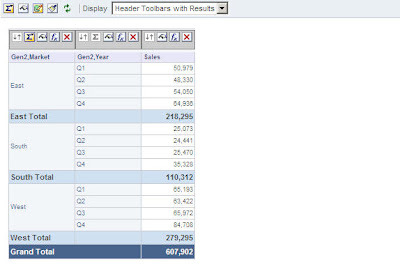 One is BI Server based totals wherein BI Server would do the totalling on a result set. 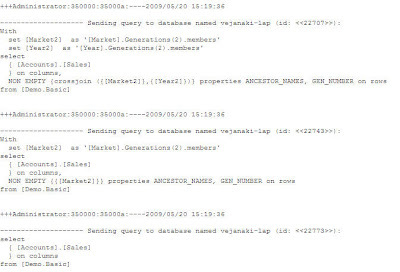 The other is data source specific totalling wherein the query is fired back to the underlying data source to obtain the totals. For example, lets just quickly import the Demo->Basic cube in to the repository and build a very simple report as shown below. As you see, it is a very simple report containing a report based total and a sub-total at the market level. Before going further, lets look at the outline of the Basic cube first. As you see, every dimension top member is set as a stored only member. If you look at the MDX of the above report, you would notice that 3 MDX queries would be fired. One for the base report , one for the grand total and the other for the market sub-total. The aggregation for the Measure Sales is Aggr_External in both the physical and logical layer. In Answers, the aggregation is set as default. Now, lets go to the outline and convert the Year Dimension top member to be a label only member as shown below. Now, try running the same report above. You would notice that the report level totals and sub-totals are totally wrong as shown below. The main reason for this is the fact that since we have converted the topmost member of the outline to be label-only. So for the Year dimension, it will always pick the Qtr1 value instead of totalling all the quarters. For report developers, this would turn out to be an absolute nightmare considering the fact a report based total is created under the assumption that, the totalling is done on the report and not at the data source level. Now, from Answers lets change the aggregation os the sales measure to SUM. And look at the report. 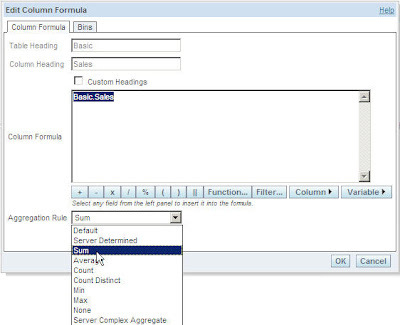 Basically, a report level SUM ensures that all the custom aggregations/totalling occuring in a pivot table/table are done at the report level instead of at the Essbase layer. 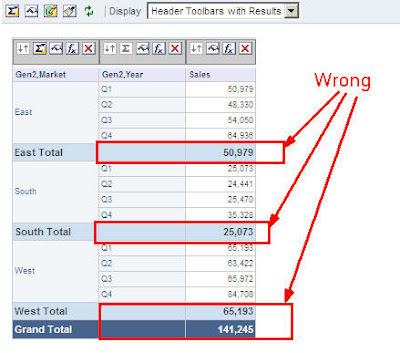 So by default, ensure that you always have SUM at the report level to ensure that you do not get wrong answers especially for totals and sub-totals. This should have given you an idea of how the aggregations at 3 layers (Physical, BMM and the Answers) can affect a report. I would cover the usage of Report Aggregations across different BMM and Physical Layer aggregations in the future. This entry was posted on May 20, 2009 at 10:13 am	and is filed under All Posts, EPM, Hyperion Essbase, OBI EE Plus. You can follow any responses to this entry through the RSS 2.0 feed. You can leave a response, or trackback from your own site. Interesting. However, I have four dimension with label only top members. I just tried this out and it’s coming back nicely with correct sums across Gen2 and Gen3 plus correct grand totals. (10.1.3.4.1 without 7349048!). “So by default, ensure that you always have SUM at the report level to ensure that you do not get wrong answers especially for totals and sub-totals.” … that’s a big statement. One of the advantages is (was) that we could rely on Essbase for aggregations and save the bi server from doing the work. 2. Or Essbase security kicks in producing #NoAccess which in turn would be converted as NULL by BI Server.